At the end of this practical course delegates will be equipped with relevant assertiveness communication skills to handle potentially tricky situations such as giving and receiving feedback, and saying "No" whilst staying focused. I found the training fun, engaging, comfortable. We were able to express views in total confidentiality and trust. A course that all employees should do in MAPS. Andrew was a very knowledgeable and enthusiast trainer . I found the course content an total eye opener and now feel I can very easily and quickly use all the pointers & information that was provided & very well explained by Andrew. It was one of the best professional skills courses I have attended, and would recommend anybody who feels they need to be more assertive, both in a home or work situation to attend. This was a highly engaging informative and interactive course. The training I received far exceed my expectations and I would recommend it to everyone who wants to learn the essential skill of assertiveness. Below are some extracts from our Assertiveness at Work manual. 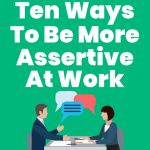 Assertive behaviour includes the ability to stand up for a person’s legitimate rights – without violating the rights of others or being overly fearful in the process. A skill that can be learned, assertive behaviour is situationally specific; meaning different types of assertive behaviour can be used in different situations. Assertive behaviour involves three categories of skills; self-affirmation, expressing positive feelings, and expressing negative feelings. Each will be explored during this course. Self-confidence is a belief in oneself, one's abilities, or one's judgment. It is freedom from doubt. When you believe you can change things -- or make a difference in a situation, you are much more likely to succeed. As a self-confident person, you walk with a bounce in your step. You can control your thoughts and emotions and influence others. You are more prepared to tackle everyday challenges and recover from setbacks. This all leads to a greater degree of optimism and life satisfaction. There are four styles of communication: Passive, aggressive, passive-aggressive, and assertive. An aggressive individual communicates in a way that violates the rights of others. Thus, aggressive communicators are verbally or physically abusive, or both. Aggressive communication is born of low self-esteem, often caused by past physical or emotional abuse, unhealed emotional wounds, and feelings of powerlessness. They are entitled, and that the other person “owes” them. The passive-aggressive person uses a communication style in which the individual appears passive on the surface but is really acting out anger in a subtle, indirect, or behind-the-scenes way. Passive-aggressive people usually feel powerless, stuck, and resentful. Alienated from others, they feel incapable of dealing directly with the object of their resentments. Rather, they express their anger by subtly undermining the real or imagined object of their resentments. Frequently they mutter to themselves instead of confronting another person. They often smile at you, even though they are angry, use subtle sabotage, or speak with sarcasm. A person who has a strong sense of personal worth makes a confident, positive appearance. In the dictionary, appearance is defined as an external show, or outward aspect. Your confidence depends significantly on your personal thoughts and perceptions about the way you look. Body language is a form of non-verbal communication involving the use of stylized gestures, postures, and physiologic signs which act as cues to other people. Humans unconsciously send and receive non-verbal signals through body language all the time. Eye contact. The impact of your message is affected by the amount of eye contact you maintain with the person with whom you are speaking. One who makes eye contact is normally perceived as more favourable and confident. Posture. Find comfortable sitting and standing postures that work for you; avoid any rigid or slouching positions. Excessive or unrelated head, facial, hand and body Movement. Too much movement can divert attention from the verbal message. Your facial expressions should match the type of statement you are making; smile when saying “I like you”, and frowning when saying “I am annoyed with you”. Occasional gestures that reinforce your verbal message are acceptable. It takes as few as seven seconds – and no more than thirty seconds -- for someone to form a first impression about you. Like it or not, people make judgments about others right away based on a presenting appearance. And you never have a second chance to make a first impression. Below are some tips to help you make that positive first impression when someone. · Body language. Remember that body language makes up to 55% of a communication. · Dress and grooming. It's less about your budget, and more about clean, pressed and event-appropriate clothing with neat grooming. · Handshake. Use a medium to firm handshake grip, avoiding a week, one handshake or overly firm one that can cause potential discomfort to another. · Body Movement. Use a mirror, or enlist the help of a friend to make sure that your movements are not overly active --and that they support the nature of your message. Feeling and looking the part would not be complete without the voice. Given that we know that 38% of communication effectiveness is governed by voice quality, improving your overall voice message delivery is worthwhile. We are all born with a particular tone of voice, which we can learn to improve. The goal is to sound upbeat, warm, under control, and clear. Here are some tips to help you begin the process. 5. If you have a voice that is particularly high or low, exercise it’s by practising speaking on a sliding scale. You can also sing to expand the range of your voice. 8. Enlist a colleague or family member to get feedback about the tone of your voice.